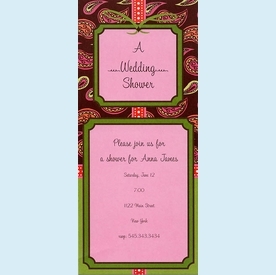 Fun paisley pattern in brown, pink and green looks like the season's hottest color combo. Great for a printed invitations, or place your 3.5"x5" photo in larger spot for use as a photo card. NOTE: Only 4 sets left! SIZE DIMENSIONS: ~4.25" x 9.5"